-How Antonio monetizes his podcast. -3 date rule - 8-10 hours is what it takes before someone will buy. -How living on the streets has shaped Antonio as a business entrepreneur. -Learning success from your failures. -The importance of character – you attract what you are – and building a strong team. -Stop chasing people who are not your customer! -Add more value to your customer than anyone else will and do things that don't scale! -On social media – only post what your network wants to have posted. Only post if it has a high VRIN Score. "If they know you, they’ll follow you, but if they trust you, they’ll buy from you." 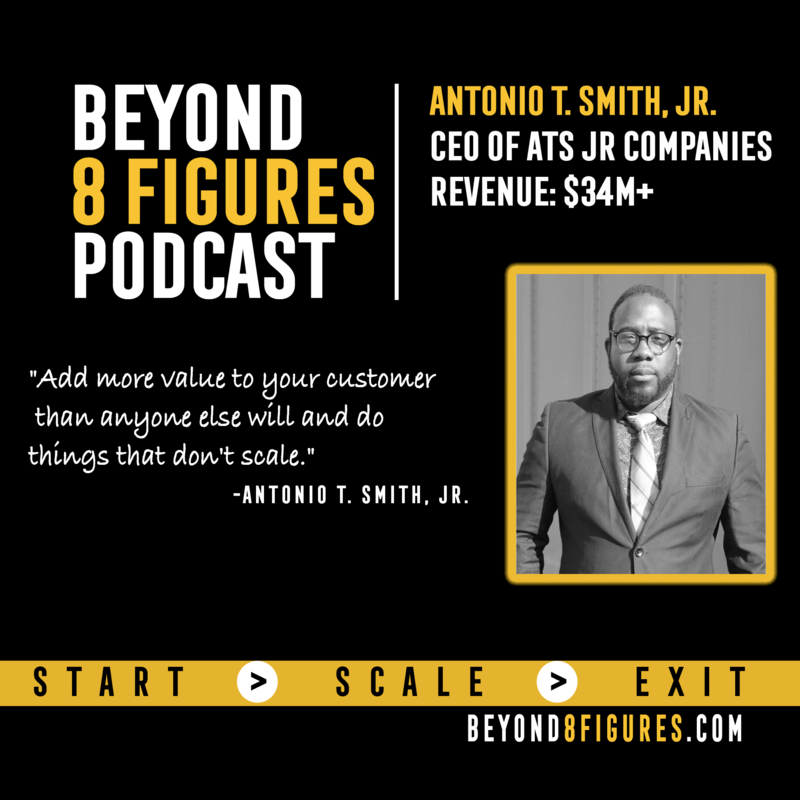 — Antonio T. Smith, Jr.
About Antonio T. Smith, Jr.: Antonio T. Smith, Jr. is the C.E.O. of The ATS JR Companies, a top personal development and training company that offers people from small business owners, to managers, to entrepreneurs, to stay-at-home moms, and college students reliable, high-quality resources through coaching, motivational speaking, and free and paid resources, and the active CEO of The ATS JR Business University, a university developed to guide you through broke to profitable. During his growth season and learning and mastering the art of Business, he started several podcasts to share his wealth of knowledge to help others master the art of business. These podcasts include Brick By Brick, The Secret to Success, Overcoming Low Self Esteem and his most recent and quickly growing podcast, Awareness TV. Antonio T. Smith, Jr. was born on the island of Galveston, TX. At the age of six, Antonio had to overcame abandonment, homelessness, brokenness and living in a dumpster until the age of 14. Antonio’s childhood helped build him to become the person that he is today because he had to teach himself the same “Plant Better” Principles that he teaches us today.